Case3:12-cv SI Document89-1 Filed10/09/13 Page1 of 12. 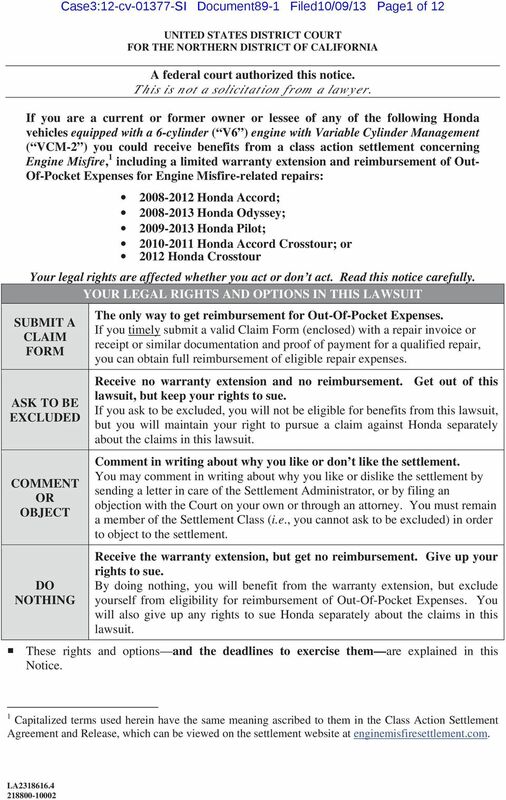 A federal court authorized this notice. This is not a solicitation from a lawyer. 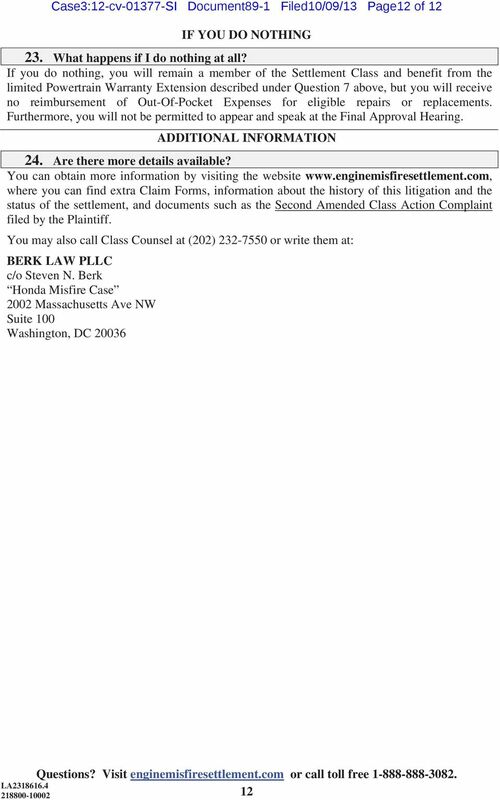 Download "Case3:12-cv-01377-SI Document89-1 Filed10/09/13 Page1 of 12. A federal court authorized this notice. This is not a solicitation from a lawyer." 2 The Court in charge of this case still has to decide whether to approve the settlement. 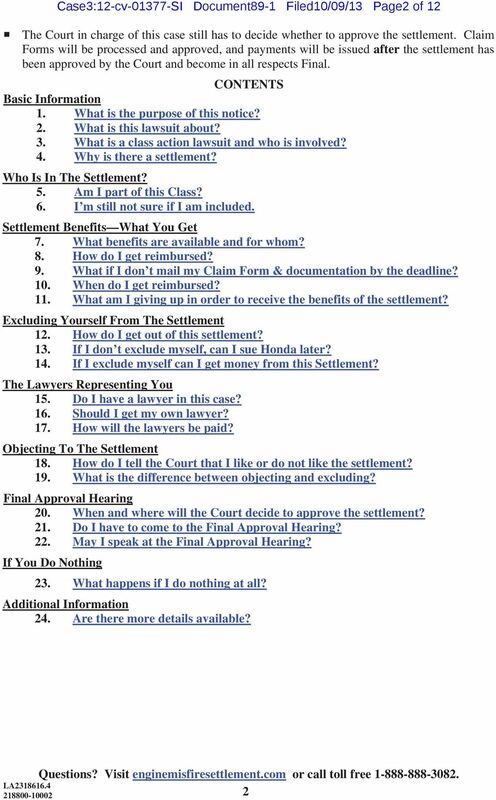 Claim Forms will be processed and approved, and payments will be issued after the settlement has been approved by the Court and become in all respects Final. CONTENTS Basic Information 1. What is the purpose of this notice? 2. What is this lawsuit about? 3. 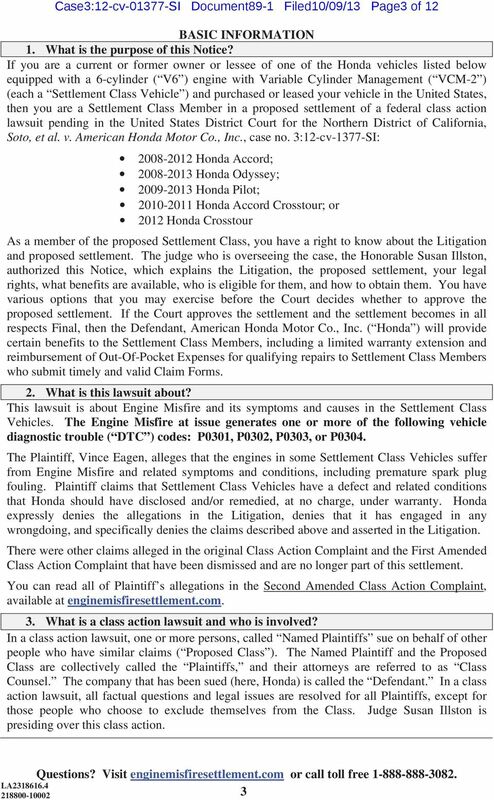 What is a class action lawsuit and who is involved? 4. Why is there a settlement? Who Is In The Settlement? 5. Am I part of this Class? 6. I m still not sure if I am included. 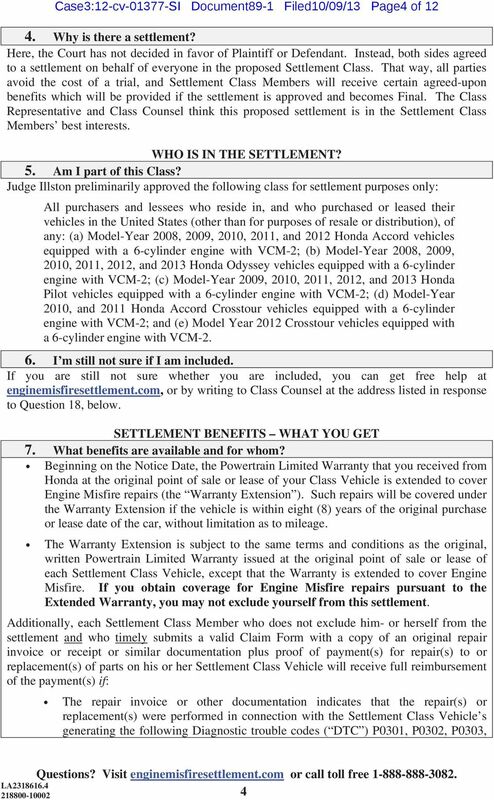 Settlement Benefits What You Get 7. What benefits are available and for whom? 8. How do I get reimbursed? 9. 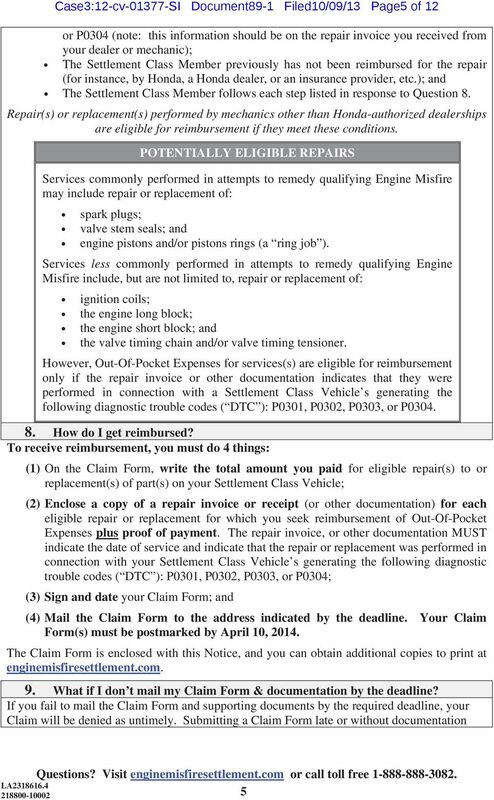 What if I don t mail my Claim Form & documentation by the deadline? 10. When do I get reimbursed? 11. 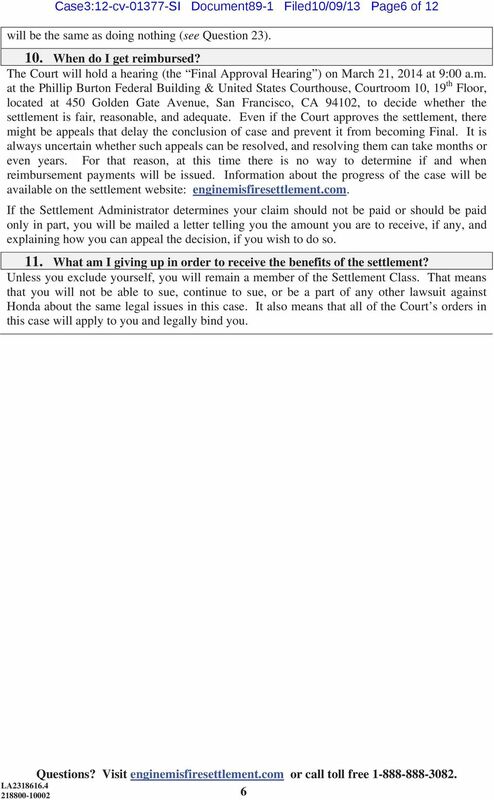 What am I giving up in order to receive the benefits of the settlement? Excluding Yourself From The Settlement 12. How do I get out of this settlement? 13. 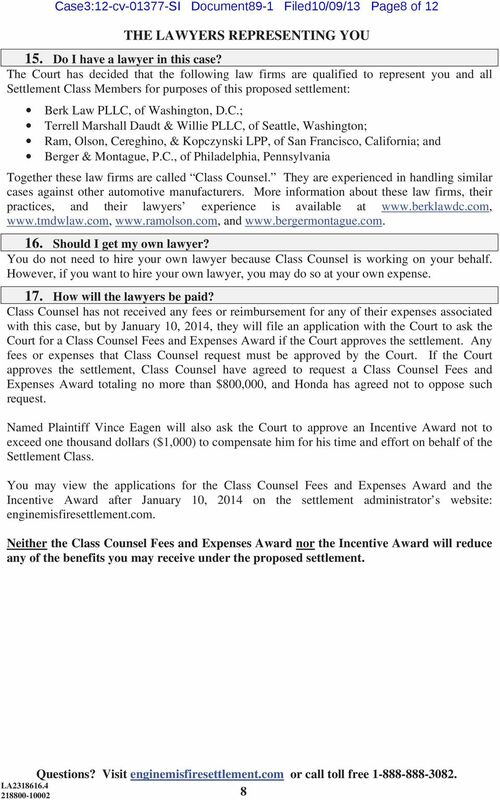 If I don t exclude myself, can I sue Honda later? 14. If I exclude myself can I get money from this Settlement? The Lawyers Representing You 15. Do I have a lawyer in this case? 16. Should I get my own lawyer? 17. How will the lawyers be paid? 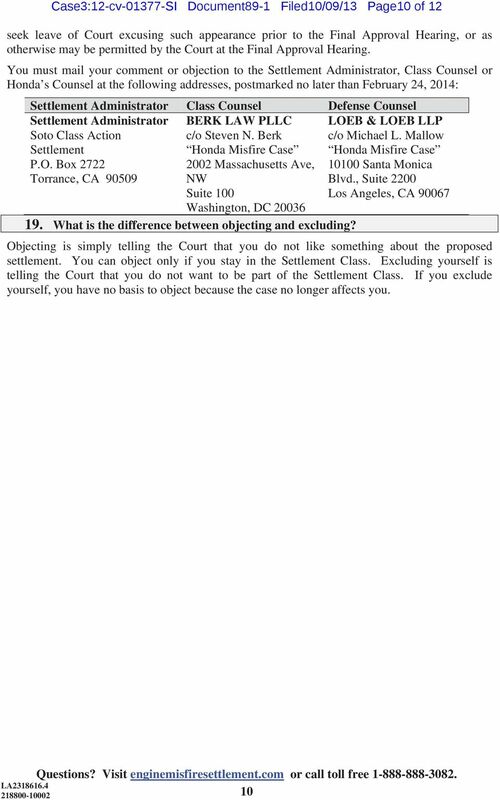 Objecting To The Settlement 18. How do I tell the Court that I like or do not like the settlement? 19. What is the difference between objecting and excluding? Final Approval Hearing 20. When and where will the Court decide to approve the settlement? 21. 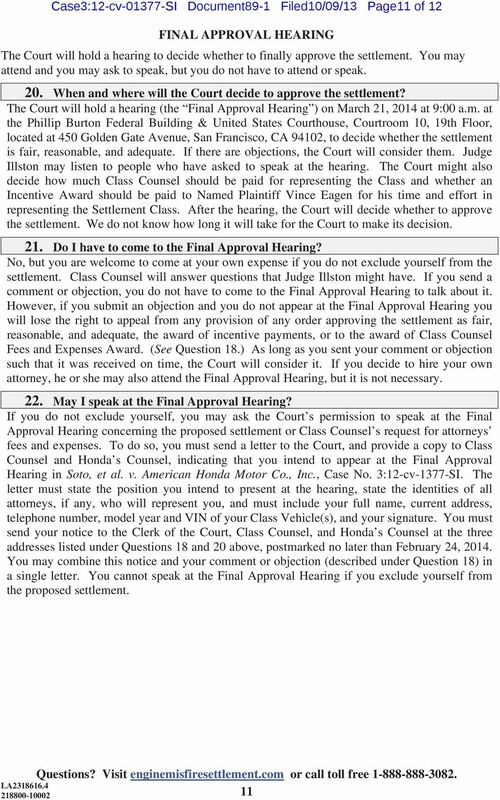 Do I have to come to the Final Approval Hearing? 22. May I speak at the Final Approval Hearing? If You Do Nothing Case3:12-cv SI Document89-1 Filed10/09/13 Page2 of What happens if I do nothing at all? Additional Information 24. Are there more details available? 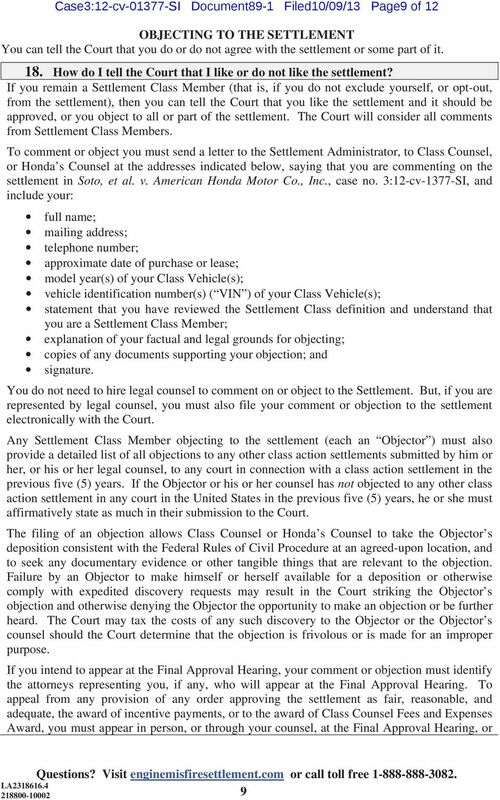 HONDA CANADA SUSPENSION CLASS ACTION NOTICE OF CERTIFICATION AND PENDING SETTLEMENT APPROVAL HEARING This Notice relates to a certified class action in Kathleen Thorpe v. Honda Canada Inc., Q.B.G. No. CLASS NOTICE. This is not a solicitation from a lawyer. A federal court authorized this notice. 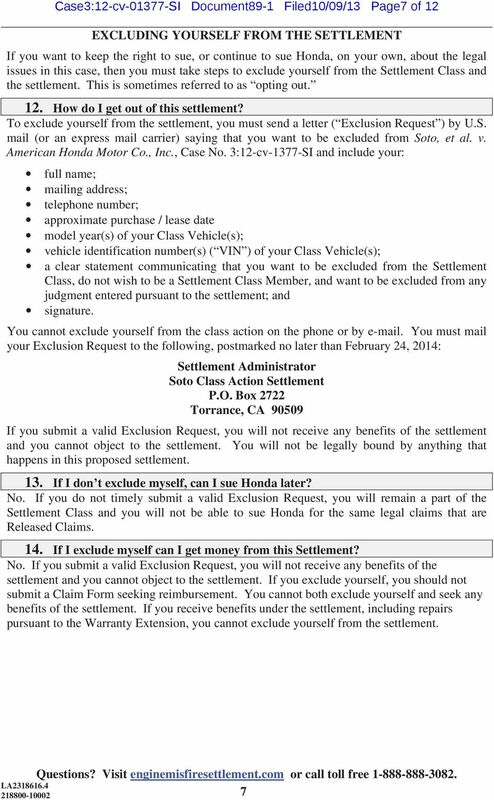 CLASS NOTICE UNITED STATES DISTRICT COURT CENTRAL DISTRICT OF CALIFORNIA - WESTERN DIVISION In Re: Hyundai and Kia Fuel Economy Litigation, No. MDL 13-2424-GW (FFMx) This is not a solicitation from a lawyer.